To frame a bathroom mirror, cut pieces of wood trim to fit, paint them and secure them in place with paneling adhesive. 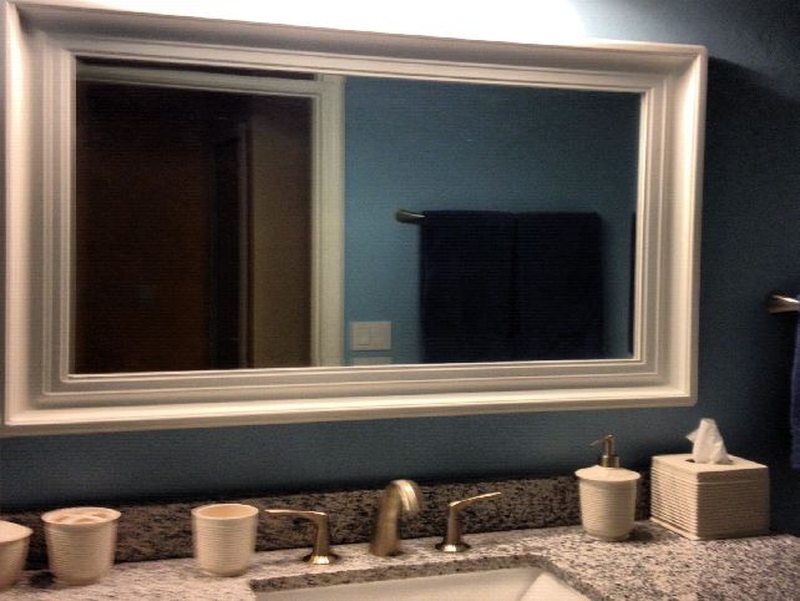 For a uniform look, try to match the mirror's trim to the existing trim in the bathroom. Framing a bathroom mirror is an easy weekend project. Supplies include wood trim, paint, paneling adhesive, painter's tape, tape measure, caulk and a level. Use the tape measure to measure the dimensions of the mirror. Cut pieces of wood trim to match the dimensions. Use a miter board to cut the ends at a 45-degree angle, if desired. Both the back and the front of the trim needs to be painted as the mirror will reflect the back edge of the trim. Paint the back first and let dry for 2 hours, and then paint the front and let dry another 2 hours. Lightly sand with a fine-grade sanding block, wipe clean and apply a second coat of paint. Let dry for 12 hours. Use paneling adhesive where the top piece of the frame will go. Position the trim, ensure it is level and secure with painter's tape. Repeat this step with the two sides and the bottom piece last. Check all the joints to ensure proper fit and let dry for 24 hours.